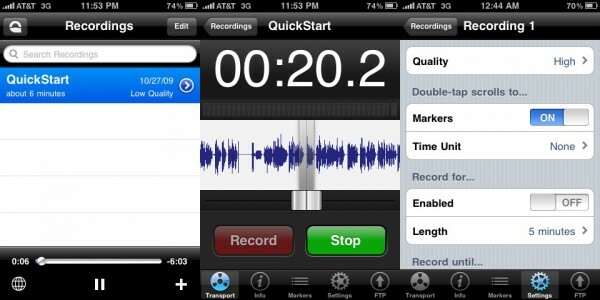 Apple’s Voice Memos App may offer an easy way to record audio notes on the iPhone and iPod Touch, but the built-in microphone doesn’t always cut it. One solution for improving audio recordings is Blue Microphones’ Mikey, a small external microphone that plugs into the dock connector port of most recent Apple handhelds. With powerful and high quality stereo condensers, it hopes to drastically improve recording audio quality. But is this premium accessory the best option available, or is your money better spent on a dedicated audio recorder? Blue advertises that the Mikey is an “award-winning” recording solution, and I can certainly see why – recordings sound great, as long as it’s properly configured. Fortunately, this is easy to do because the Mikey features a hardware switch with three gain settings, something that similar microphones lack. This may sound a little complicated, but it’s actually very simple. The high gain setting is for long-distance 100+ foot recording, the medium setting is for 20-100 foot recording or group speaking situations, and the low gain setting for very close-range environments such personal dictation. The Mikey can record almost anything on high gain, even at long-distance. I tested it with a noisy intersection and construction zone roughly 100 feet away and it picked up the humming and clanging clearly. This is an example of the hardware gain switch at work; a microphone not specifically configured for long-distance recording would have only picked up unrecognizable noise. The Mikey is no miracle worker though; it misses the highest highs and lowest lows, and won’t provide a CD-quality audio recording. However, what I experienced was much better than what would normally be expected from a small iPod/iPhone-powered accessory, and is far better than the iPhone’s built-in microphone. At medium gain, the Mikey does an excellent job picking up lectures and other group dialogue. It’s great to see the Mikey perform as advertised. And as a tip to owners or prospective buyers, while the high-gain setting records everything, flipping the switch to medium makes such background noise muddled and helps focus on in-range sounds. The low gain setting claims quality recordings for close range dialogue. Unfortunately, it was not as good as its counterparts. To test this, I spoke directly into the microphone at regular speaking volume. I was disappointed to discover that my voice sounded quiet and slightly muddled. It’s best described as though I were speaking through a few layers of clothing. The low-gain setting seems like it would be best reserved only for very loud situations and close environments. This setting seems out-of-place and impractical compared to the great performance of its medium and high counterparts. While it is a shame that the low gain setting does not live up to expectations, the medium-gain setting still serves it’s purpose for close-range situations. As a whole, the Mikey’s performance isn’t for everyone. If you simply want a microphone to record basic dictation and be able to understand it later, the Mikey’s price tag might be more than you need to spend. If you desire the capability of distance-recording or value the audio quality, then the Mikey’s custom settings and performance certainly make it worth looking into. The Mikey rocks the classic angular, hole-punched microphone look. 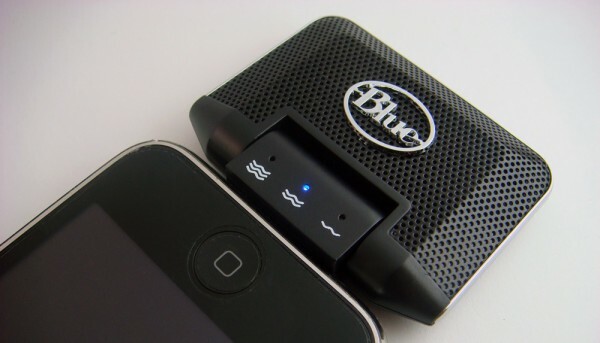 There are three blue LEDs on the lower neck of the device that light up to indicate the current gain setting. The gain switch is directly behind the indicator lights. The head of the microphone rotates back and forth 90 degrees and clicks with a satisfying snap as it bends. The Mikey plastic body feels sturdy and there was only the tiniest bit of flex as I squeezed the hole-punched surface. I’m sure the Mikey could stand up to the abuse of being thrown around inside a bag or jacket pocket. When it comes to style, the Mikey isn’t the sleekest-looking or smallest microphone out there, but then again, it’s is a function-over-form recording device. I have only one complaint about the Mikey worth mentioning. The small, somewhat recessed switch for the gain setting requires a little too much digging in with a fingernail to tweak the gain for my taste. Although it does prevent accidental adjustments from being an issue, it might be an issue for those with close-cut fingernails. When plugging the Mikey in, iPhone users will see a pop up that recommends enabling airplane to prevent possible GSM interference while recording. This is a minor annoyance, but you probably wouldn’t want a call interrupting a recording session anyway. The Mikey will still work if you choose to ignore the warning. Other users’ results may vary, but I did numerous tests of Mikey without airplane mode enabled and faced no interference. The Mikey is compatible with Apple’s Voice Memos app on the iPod Touch and iPhone. 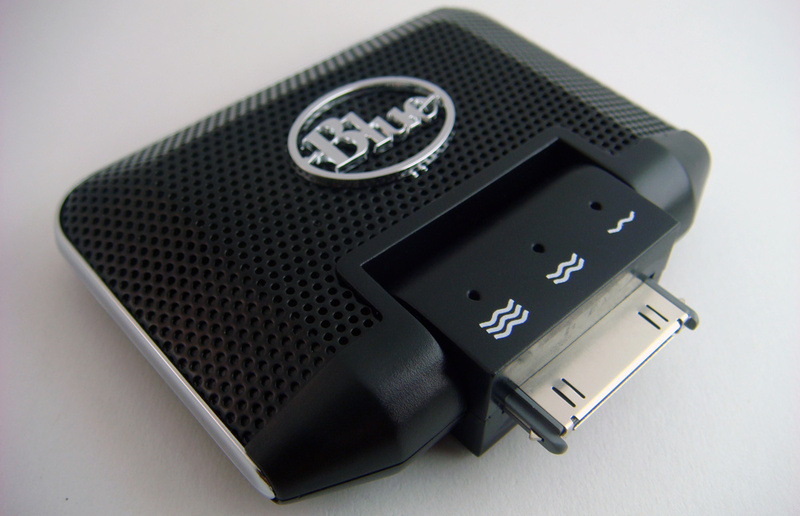 Additionally, there is Blue’s free App Store application called Blue FiRe (iTunes link), Evernote (iTunes link), and a multitude of other applications that will recognize external microphones. The Mikey uses Apple’s built-in software on standard iPods, Classics, and Nanos. Regardless of the device, simply plug the Mikey in, and it will automatically be detected and behave as if it’s part of your iPod or iPhone. The Mikey delivers crisp, high-quality recordings, and unlike many other microphones, it can do so even from over 100 feet away. Additionally, the integrated gain setting switch allows for quick, on-the-fly sensitivity adjustments, which is a major convenience. While I did critique the low gain setting for reducing audio fidelity, the Mikey still remains a highly versatile microphone even with just the medium and high settings. At $79, the Mikey is not cheap, and there are competing microphones out there for less than a fraction of the price. For those of you who need a microphone simply for short-range recording of dictation or interviews, you may not benefit from paying a premium amount for the Mikey. However, those of you who do desire an easy-to-configure, compact, powerful microphone should definitely give the Mikey a try. It’s certainly worth it if you are a student in a lecture hall, a businessperson at a conference, or an interviewer stuck in a noisy environment. With that being said, if you are ready to purchase the Mikey now, you may want to hold out. That’s because Blue Microphones is launching a new and improved second-generation model. The new model arrives this summer and boasts improved iPhone compatibility plus a refined design. Skatter Tech will definitely get a unit in for review, so stay tuned.